UMBC professor Dr. Tim Oates has been named an Oros Family Professor in Computer Science and Technology. The five-year endowed professorship will fund Dr. Oates’ newly proposed research project in the area of mobile healthcare. Read more about endowed professorships at UMBC here. 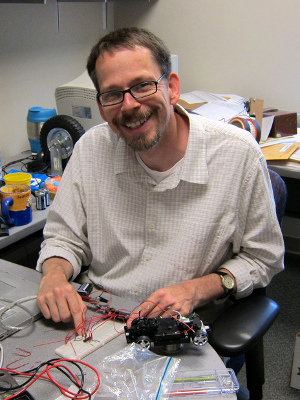 A professor of computer science and electrical engineering, Dr. Oates is principal investigator in UMBC’s Cognition, Robotics and Learning (CoRaL) Lab, where he pursues research in the broad areas of artificial intelligence, machine learning, robotics, and natural language processing. “I was delighted to recommend Dr. James T. Oates’ appointment as Oros Family Professor in Computer Science and Technology, an endowed professorship established to honor and support the work of faculty pursuing scholarly activity in computer science,” says Dr. Warren Devries, Dean of UMBC’s College of Engineering and Information Technology. The funds will support graduate students to work with Dr. Oates on a project to improve healthcare in developing countries. “The issue is that in developing countries, almost everything is still done on paper,” explains Dr. Oates. That means that every record—things like immunization records and medical histories–are taken by hand. It’s an inefficient process that makes it hard to keep track of medical data. His proposed solution is to develop an algorithm that can extract data from a cell-phone photo of the paper record. Once digitized, the medical data can be more easily shared and analyzed. Dr. Oates chose to develop this technology for cell phones because they are a common and reliable tool in these areas, he explains. In many cases, cell phones can be found where basic needs are absent. “There are people living in villages that don’t have access to clean water, but they have cell phones,” he says. Dr. Oates joins last year’s Oros Family Professor appointee, Dr. Anupam Joshi, who is similarly using the funds for his research in mobile healthcare. This story originally appeared on the CSEE website.